With a larder well stored, and good liquors and stable." Although written in the early 1800&apos;s to advertise Luke Usher&apos;s inn in Lexington, this rhyme might just as well be about Bluegrass Bed & Breakfasts in the 21st century. At rustic cabins, elegant antebellum mansions, cozy farmhouses and city homes in Lexington and the surrounding area, Bluegrass hosts still treat guests "as well as they are able" with delicious food and drink, and in some cases even horse accommodations. There have been a few changes, of course. Today&apos;s guests no longer sleep on the floor on buffalo robes if all the beds are taken, and strangers aren&apos;t expected to share a room (in most cases, not even a bath). The well-stored larder tends toward country ham and gourmet breads instead of barbecue bear and johnnycake. And along with the stable, there are Jacuzzis, hot tubs, private lakes or swimming pools, cable television, conference rooms, airport pickup and a host of other amenities. Bed & Breakfast & Bluegrass is a combination of charming tradition, historic atmosphere and modern conveniences that most guests find downright poetic. Bluegrass Note: "Bed & Breakfasts" have been a Bluegrass tradition since the earliest settlers arrived. In the late 1700&apos;s, there were so few towns and villages that every station, cabin or house was an inn, every settler a part-time innkeeper. The arrival of a traveler was a welcome social event in the secluded life of the Kentucky wilderness. Here are some of the places to "stop and regale." 3250 Delong Road, Lexington, KY 40515. (843) 327-3277. Fairyhouse Hall can accommodate up to 16 guests in six bedrooms, five of which have ensuite bathrooms. 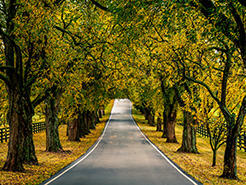 Located on a sustainable working estate, it is just 8 miles from downtown in the heart of Bourbon and horse country. Proprietor and “Chefarmer” Shane Haffey is available for private dining for guests. Children are allowed with advance notice. 507 North Broadway, Lexington, KY 40508. (859) 420-2683. The Lyndon House is a remarkable combination of meticulous renovation and state-of-the-art amenities. Located in the heart of the historic district, this 1880&apos;s mansion has two suites and three bedrooms, each with their own bath and equipped with wireless internet access and cable TV. If you don&apos;t want to negotiate the splendid Victorian staircase, there is a full-sized elevator. The walls in the common areas feature outstanding art, including large format paintings by Lexington artist Frederico Pizzuro. Your host Anton Giovanetto appreciates fine food and will prepare a hot breakfast for you with his signature homemade breads. Many of the city&apos;s finest restaurants, shops and theatres are within easy walking distance. Children and pets are welcome with prior arrangement. 3463 Rosalie Lane, Lexington, KY 40510. (859) 230-9040. Located on a prominent Thoroughbred horse farm just minutes from Keeneland Race Course and Blue Grass Airport, this B&B has been stunningly renovated over the past year. Owned by the Hills, who also own and operate Margaux Farm, it boasts two spacious suites in the farm&apos;s guest quarters overlooking the broodmare paddocks and three distinctively appointed single rooms in the Southern Colonial main home, all with private baths. All guests have access to the living room for music and reading, or the den with a fireplace. No pets. Not appropriate for guests with children under age 16. 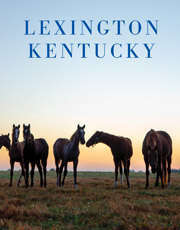 Bluegrass Note: By the early 1800s, as Lexington grew into the "Athens of the West," the city boasted numerous taverns and inns, many in private residences. Some of them were Postlewait&apos;s Tavern, Sign of Cross-Keys, The Fried Meat Tavern, Travelers Hall and the Indian Queen. The term "hotel" did not come into use until after 1825. The Doctor&apos;s Inn, 617 Chestnut, 40403. (859) 986-3042. This elegant Southern mansion with stunning panoramic view is appointed with genuine handcrafted Berea College furniture. Two rooms with private baths. Full hearty or healthy breakfast. No pets. Not appropriate for children. Pinnacle View Inn, 491 Log Cabin Road, 40403. (859) 986-0044. A modern romantic bed and breakfast with a breath-taking panoramic view overlooking the Red Lick Valley. Pinnacle View Inn has a lovely garden, a dramatic front living area and an upstairs sitting area for your enjoyment. It is committed to initiatives such as water reclamation, recycling, and low energy use, and has the only Tesla charging station between Lexington and London, KY. Four suites, all with private bath. Free wireless internet access and a hearty home-cooked breakfast included. The Farm LLC, 450 Waterworks Road, 40422. (859) 583-0244. This is a hands-on working farm, and guests can get the full experience if they&apos;d like, from milking goats to guided barn tours. The beautiful antebellum southern estate home features four large bedrooms and five suites. There are also two villas with full kitchenette. For an extra cost, you have access to a personal chef, private care services, security, or child care. Meeting House, 519 Ann Street, 40601. (502) 226-3226. The home belongs to the Civil War Era and is in the heart of the Historic District. Innkeepers Gary and Rose Burke are eager to share the history and folklore of this charming 160-year-old home. Four bedrooms; four private baths. Children welcome; no pets. Blackridge Hall Bed & Breakfast, 4055 Paris Pike, 40324. (502) 863-2069. This new Georgian-style home with elegant entry hall with a massive chandelier overlooks a horse farm. Queen-size beds, Jacuzzis, kitchenette, and full gourmet breakfast. Three master suites and three guest rooms, all with private baths. Convenient to I-75 and I-64. No children or pets. Jordan Farm Bed and Breakfast, 4091 Newtown Pike, 40324. (502) 863-1944. Stay in a charming carriage house located on a 100-acre working Thoroughbred farm. Three spacious suites with private entrances, marble baths, Jacuzzis, color TVs and decks. Private fishing lake. Children eight and older; no pets. The B&B at Queenslake, 292 Soards Road, 40324. (702) 885-1253. Situated on a scenic 140-acre horse farm with stunning sunrise and sunset views and a 40-acre private lake. A Greek revival home offers three king bedrooms, each overlooking the lake. Well behaved children and pets are welcome. Overnight stabling, plus indoor and outdoor arenas plus riding trails, are available for people travelling with their horses. Canaan Land Farm Barn and Breakfast, 700 Canaan Land Road, 40330. (859) 734-5226. Stay near Shaker Village. A variety of accommodation is available on this 18th century farm. Bring your bike, or your horse, hiking boots, and a good book, and reconnect with nature at your leisure. Wildlife abounds, and there are horses on the property that enjoy a little pampering by guests! Coleman House Bed & Breakfast, 362 North College Street, 40330. (859) 734-4902. Treat yourself to an authentic, vintage experience surrounded in an atmosphere of luxurious modern convenience. The Coleman House caters to the discerning client seeking a genuine Kentucky experience. The home was built in 1879. A huge front gable gives the home a Queen Ann look, but the four massive columns are classic Tuscan. Three guest rooms. Shops and restaurants are within an easy stroll. Ashley Inn, 128 Ashley Inn Way, 40444. (859) 548-4922. With five unique spacious guest rooms, all with private baths, and one pet suite, The Ashley Inn is perfect for a weekend getaway or an equestrian layover. 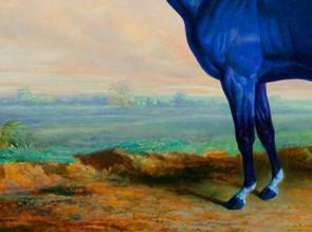 The B&B is located on the grounds of the Meadow Lake Equestrian Center. This working horse farm also has RV hookups. Scottwood Bed & Breakfast, 2004 East Leestown Road, 40347. (859) 846-5037. Two guest suites and a guest cottage await you at this 1795 Federal home located on South Elkhorn Creek. All rooms are furnished with queen beds and TV and have private baths. Children and pets welcome with prior notice. The Corner House, 228 Richmond Avenue, 40356. (859) 881-5229 or (877) 571-5777. Convenient to antique stores, golf courses and many fine restaurants, you can enjoy a game of pool or darts in the billiard room or try your hand at the antique organ in the parlor. The Corner House has three guest rooms with private baths and a wonderful wrap-around porch for relaxing. There is also a cottage. Full traditional southern breakfast. Children and pets welcome with prior notice. Bluegrass Note: The O&apos;Neal Log Cabin, a bed and breakfast near Nicholasville, was built by George O&apos;Neal, a Revolutionary War veteran who was a scout and sharpshooter for a Virginia regiment. The cabin was dismantled and moved to its current location. The Treehouse at Stoner Creek, 131 Taylor Avenue, 40361. (859) 707-0369. This rustic (but new!) home just inside the Paris city limits sits right on Stoner Creek, next door to famous Claiborne farm. Wide decks offer the perfect spot for relaxing, rain or shine. The two guest rooms share a bath. Enjoy breakfast inside, or on the screen-in porch. Pontoon boat, kayaks and canoes available. The Guesthouse at Rosecrest Farm, 1276 Winchester Road. 40361. (859) 987-7500. Enjoy the serenity of a stay in the guest house of a Thoroughbred farm. Welcoming porches offer great views over looking 150 acres. Two suites with private baths. No pets. Bluegrass Note: Want to see what a real 18th-century Bluegrass inn was like? Tour Duncan Tavern in Paris. Built in 1788, this 20-room home hosted such famous guests as Daniel Boone and Simon Kenton. It&apos;s now Kentucky headquarters for the Daughters of the American Revolution. Open Tuesdays through Saturdays, 10 a.m. to noon and 1 to 4 p.m. (859) 987-1788. The Bennett House, 419 W. Main Street. 40475. (859) 623-7876. Step through double entry doors into this Queen Anne Romanesque brick home. Three guest rooms and two suites, all with private baths. Bennett House also hosts special events. Blue Heron Retreat Center and B&B, 270 E. Prong Road, 40475. (859) 527-0186. This Victorian house is situated on 30 acres with scenic views of waterfalls and meadows. Business, church and civic groups are welcomed for day retreats. Three guest bedrooms have private baths; one has a whirlpool. There is also a suite with a full kitchen and balcony. Children welcome; no pets. Charred Oaks Inn Bed & Breakfast. 341 Lexington Street, 40383. (513) 739-6156. Quality antiques and original artwork create a warm and inviting environment. Special features include large rooms with high ceilings, fireplaces, and original wood floors. Along with gracious hospitality, you&apos;ll be served Southern traditions at breakfast and evening refreshments, plus personalized concierge service. Four guest rooms with modern en suite bathrooms. No pets or children under 12. Montgomery Inn, 270 Montgomery Avenue, 40383. (859) 251-4103. Three stories of Victorian ambiance include ten guest rooms, each with TV, private bath and Jacuzzi. Full gourmet breakfast served. Children with advance warning; no pets. Rabbit Creek, 1010 Steele Road, 40383. (859) 873-1920. This large modern home has an in ground pool and a pool room with wet bar, a redwood sauna, beautifully landscaped grounds and a professional in-house massage therapist. There are eight spacious bedrooms with private baths; four with balconies. The Ruin Bed and Breakfast, 3629 McCracken Pike, 40347. (859) 873-7400. This lovely home literally rises from the ruins of a dilapidated old distillery. Two guest rooms are set in a newly-constructed building and share a cozy common living area, balcony and expansive gardens. The history and character of this B&B is unique and it is perfectly situated if you came to Kentucky to explore horse country or Bourbon country. A Storybook Inn Bed & Breakfast, 277 Rose Hill Avenue, 40383. (859) 879-9993. Four spacious suites in an outstanding pre-Civil War Era mansion, plus a guest house, all on park-like grounds within walking distance to quaint downtown Versailles. Elevator, mini-frig in each room and high speed internet are just a few of the modern amenities in this gracious home. Full European-style breakfasts with fresh local ingredients. Twice named in the "Top 10 Bed and Breakfasts in the United States" by bedandbreakfast.com. Children welcome with advance notice. No pets. 1898 Red Bud Bed & Breakfast, 600 N. Lexington Avenue, 40390. (859) 215-6000. Cozy rocking chairs on the veranda are calling your name! Three lovingly restored rooms with private baths. Full breakfast included. Wilmore is home to Asbury College and close to High Bridge Park overlooking the Kentucky River. The Potter&apos;s Inn, 313 Walters Lane. 40390. (859) 858-0120. The Potter&apos;s Inn is a beautifully restored Victorian farm house with five guest rooms with elegant decor, a sun room, multiple dining rooms and a wrap-around porch. Breakfast is served daily and additional meals are available upon special arrangement. Children eight years or older are welcome with advance notice. No pets. Scott Station Inn, 305 E Main St, Wilmore. 40390, (270) 392-4043. The oldest continuously operating B&B in Wilmore, Scott Station is under new ownership and has been lovingly renovated without losing the charm of a 19th century inn. There are five guest rooms all with private, ensuite baths. Relax in front of the fireplace in the first floor guest lounge. There&apos;s comfortable furniture and an entertainment center. Other great spots to relax: the front porch or the private back deck and pergola. Children "who sleep quietly through the night" are welcome! No pets.